Since retiring I wanted to start a home based business and my wife had always wanted a web site to promote her quilting business. Seeing me with time on my hands she suggested I build her a web site. How could I say no after she made me such a beautiful quilt!! It takes me back to my days in Calgary, particularly those crazy Stampede Days!! I call it Dancin' Boots. We recently moved to the Sunshine Coast in British Columbia. It is a very beautiful place and we love it here, but it was quite a change from the hustle and bustle of the BIG city of Vancouver. With my computer background I thought it would be a snap to start an online home based business - I proved myself quite wrong. I was a computer tech in the "old technology days", nothing like the new technology around today, particularly with the Internet and Web Design. However, I felt it would be a good challenge and learning experience, so I started researching the vast array of web building options on the internet. It was a daunting task and after several weeks I was as much in the dark as day one!!! I was getting nowhere. With some timely luck and advice from a past business associate I discovered the Site Build It web site. Their claim to fame is to help "newbie" web developers like myself create their own web sites. But I did not want just a web site I wanted an income generating home based business. Now I hear you thinking..."Sure, been there done that" and I have been there too, and yes I had tried other "get rich quick options" and found out THEY DONT WORK!! Well, after a few days of research I decided to use the FREE trial option. 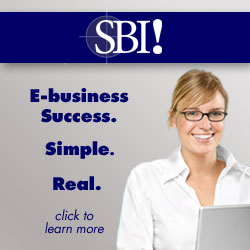 SBI was offering neophyte designers like myself all the tools necessary to develop home based business web sites, without becoming a "WEB" guru. Plus they overdelivered on a whole suite of other web based income generating opportunities that were unknown to me. Building this site has given me a greater insight into the multitude of income generating opportunities that do exist on the "Net". I am already planning my next site concept. It has been just 3 years since I started building my wife's site and as you can see the traffic is steadily growing!! I have over 85 pages up with more to come. But I have followed the SBI instructions to the letter and it works. February 2011 is our best month for traffic - both for visits and visitors. Well, as I keep building more pages traffic keeps growing. Our ad sense ads are generating some revenue and our affiliate income is growing as well. Do you need more convincing that the web tool I use is really effective for getting traffic to my site? but more importantly getting ranked high by Google? OK, in your Google browser window, key in the words "applique techniques" or "quilting lessons for beginners" or "learn how to quilt" these are really competitive keywords, but you will see my site is listed on PAGE ONE in Google!! And better yet, some queries are in the NUMBER ONE spot. Did you notice the Google results numbers?? They are in the millions in most cases!!! Would you like to build a web site that attracts this type of organic traffic for FREE!! You do not need to spend one cent on buying traffic. No ad words; no email lists, only the yearly fee for the software and hosting your site. If you are passionate about a subject... any subject and want your own home based business that attracts traffic like mine, do your self a favor and find out more about web building techniques that work Click Here to see how I built my website . Would you like a FREE E-Book on Making Your Site Sell download it here. it is a great read and shares a lot of the secrets that are critical to getting traffic to your site. This is not a GRQ - Get Rich Quick scheme. It has taken me hours of work to get to this point. It has been FUN to see the site develop like it has and to see the traffic snowball start to grow. What is so unique about this is that I did not need to learn any new computer languages or technology, it was all presented to me in a comprehensive package in plain english and I proceeded at my own pace. Finshed with Home Based Business? Return "Home"